LaGuardia Airport is beginning a multi-billion-dollar redevelopment program to completely reimagine your travel experience. Passengers will continue to travel through LaGuardia during the airport’s construction period. Parking will be limited and some roads will be closed or detoured. Customers are urged to leave additional travel time and find other means of getting to the airport. Traveling during construction can be challenging and we appreciate your patience as we work to build an exceptional airport. The pedestrian walkway along Central Terminal Drive will permanently close between Terminals B and C.
Travelers and airport personnel should take the Purple Route free airport shuttle bus to gain access to Terminals C and D from Terminal B.
LaGuardia Airport travelers are urged to allow extra time and use mass transit during holiday week. View full list of Holiday Travel Tips. New Hourly/Cell Phone Lot (P5), Daily (P4 and P6) and Long-Term (P10) parking lot rates at LaGuardia Airport take effect. Visit Parking Lot Rates for more information on the new rates. To reduce roadway congestion for vehicles picking up and dropping off passengers, the first three hours of parking for customers in the Hourly/Cell Phone Lot (P5) are free. Visit Cell Phone Lot for more information. Due to a series of roadwork on Central Terminal Drive west of Terminal B, Runway Drive and 94th Street, Terminal B roadways may experience some congestion. Follow roadway and detour signs to navigate LaGuardia Airport. Central Terminal Drive is permanently closed between Terminals B and C to motor vehicles. 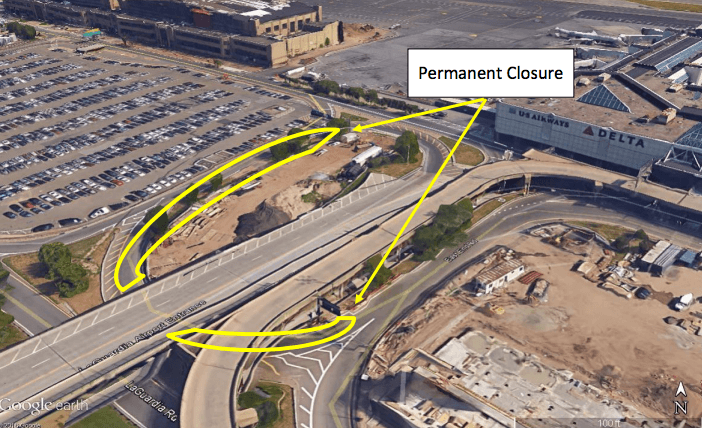 The pedestrian walkway between Terminals B and C will remain open. For detour information visit the Central Terminal Drive Closed webpage. The south loop exit to 102nd Street Bridge off the East End Road is permanently closed. Motorists should follow roadway signs for detours to alternate airport exits. All Rental Car Shuttles now pick-up and drop-off customers in front of Terminal A (Marine Air Terminal) in the Rental Car Shuttle Transfer Point. Travelers can take the free airport shuttle Blue or Red Route to Terminal A (Marine Air Terminal) to connect with shuttle buses for Advantage, Alamo, Avis, Budget, Dollar, Enterprise, Hertz, National, Payless and Thrifty car rental facilities. An emergency order is in effect by The U.S. Department of Transportation to ban all Samsung Galaxy Note 7 devices from air transportation effective noon October 15. Individuals should not transport the device on their person, in carry-on baggage, in a checked bag or shipped as cargo. The U.S. DOT has additional information on what travelers should know about the ban. Frontier Airlines flights now depart from Concourse C in Terminal B. Passengers must go through the Concourse C security screening to access their departure gate. This change is to help facilitate the building of a new Terminal B. Lot P7 now also serves as an alternate Terminal B passenger pick-up area. Meeters and greeters can wait in the Lot P7 pick-up area for arriving travelers. No unattended vehicles are permitted in the Lot P7 passenger pick-up area. Arriving customers should take the free on-airport Blue Shuttle Bus to Lot P7 to meet their ride. Due to construction, the west end taxi stand at Terminal B has been relocated to the east end of Terminal B. This change is to help reduce traffic in front of the terminal and move you along faster to your destination. To find the new taxi stand, simply follow the signs to the east end of Terminal B. Allow at least an additional 5 minute walk to get to the taxi stand, depending on where you are on the arrivals level. Due to construction at LaGuardia, terminal roadways may be congested. Please allow extra time when traveling to the airport. A new traffic pattern is in effect at 94th Street at the airport. This roadway reconfiguration is necessary to create additional space to construct a new parking garage. View map of the new traffic pattern with information on getting to your terminal. Passengers are encouraged to check-in a minimum of two hours prior to flight departure. This allows enough time for airline check-in, obtaining a boarding pass and going through the security screening process. 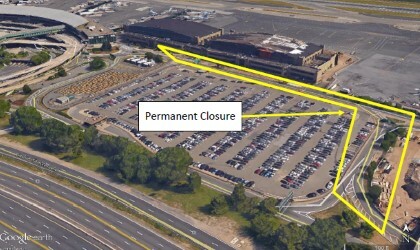 Daily parking in Lot P2 at LaGuardia Airport is closed for airport redevelopment. Travelers can park in P4 and P5 for easy access to Terminals B, C and D. A new long-term Lot P10 is now open. Visit our Terminal Maps for more information. Premium Reserved Parking is available, as are free shuttle buses at all parking lots and terminals. New airport connection buses, Purple, Red and Blue now operate on airport replacing the Route A and B shuttles. Visit Connecting Within LaGuardia for route map and operating times. Due to airport redevelopment, the 102nd Street bridge closes to inbound airport traffic. Outbound vehicle lanes and sidewalk from LaGuardia Airport will remain open. Traffic is detoured to 94th Street via Ditmars Blvd. for access to Terminals B, C and D.
MTA public buses with service to LaGuardia Airport have been rerouted on airport due to Terminal B construction. Detailed service changes can be found on the Changes to Bus Routes/Stops at LaGuardia page or at MTA.info. Public buses M60 SBS, Q48, Q70 LTD and Q72 stop at Terminal B on the departures level before continuing to Terminal D and then to Terminal C.
Q47 public buses experience no route changes. M60 SBS and Q48 buses will not service Terminal A (Marine Air Terminal).